The entrance to Le Bistro. Guests do not have to dine in either of the main dining rooms. 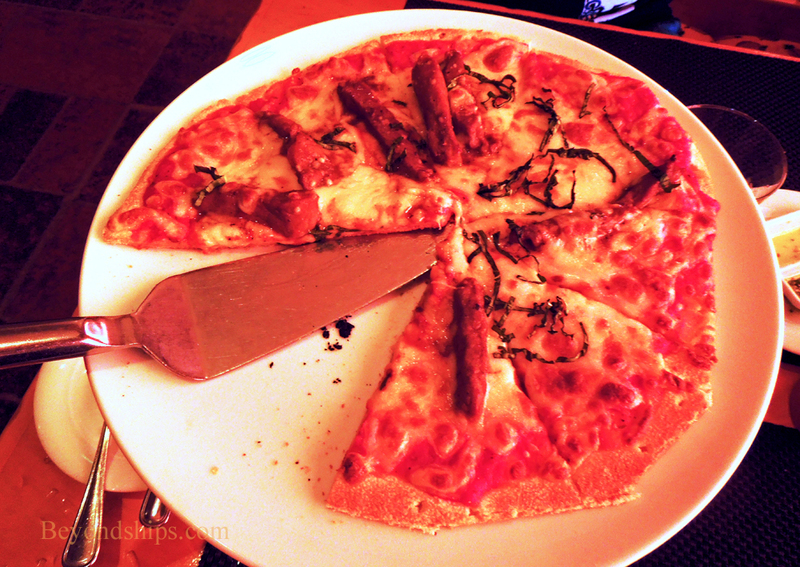 As an alternative, guests can dine in one of the several specialty restaurants. Each of these venues seeks to present a different dining experience, not just in the food that it serves but in atmosphere. There is a cover charge for each of the specialty restaurants. Le Bistro is a much-loved institution on Norwegian ships. On Jewel, it is located in an intimate room on Deck 6 midships. The room is reminiscent of a 19th century upscale Parisian restaurant. The cover charge for Le Bistro is $20. 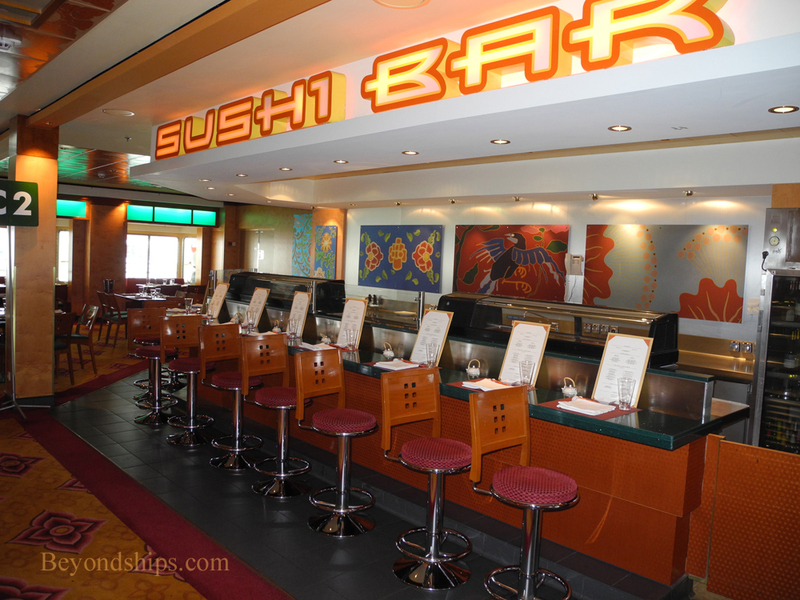 Immediately above Le Bistro on Deck 7 is a complex that includes three Asian style restaurants. There are two Japanese-inspired venues, the Sushi Bar and the Teppanyaki Room, where chefs with flashing knives cook the meal as you watch. The third restaurant in this complex, Chin Chin, is more difficult to describe. 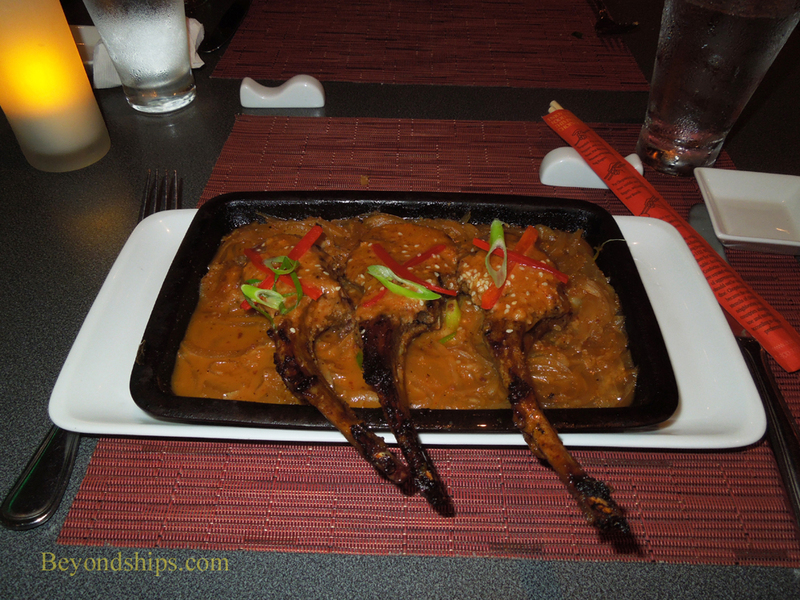 Some guests assume that it is a Chinese restaurant like the ones in almost every American town. Chin Chin has a cover charge of $15. 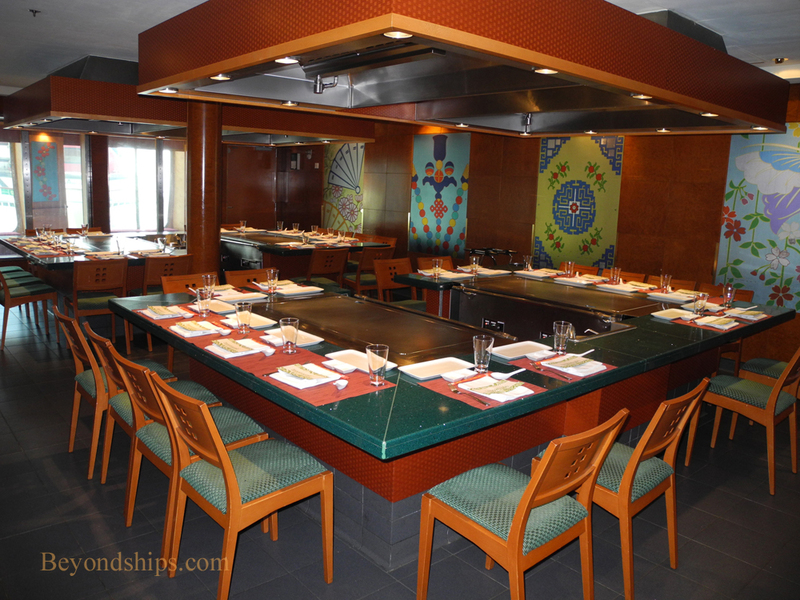 The Teppanyaki Room is $25 and the Sushi Bar is priced ala carte. 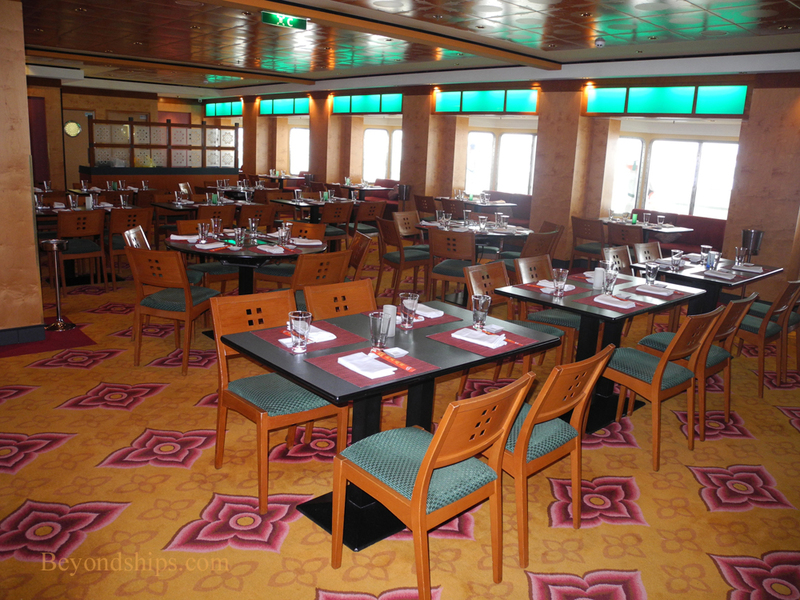 Another Norwegian Cruise Lines' favorite is Cagney's. On the Jewel, it is located at the top of the ship on Deck 13 midships, which gives it impressive view both to starboard and to port. 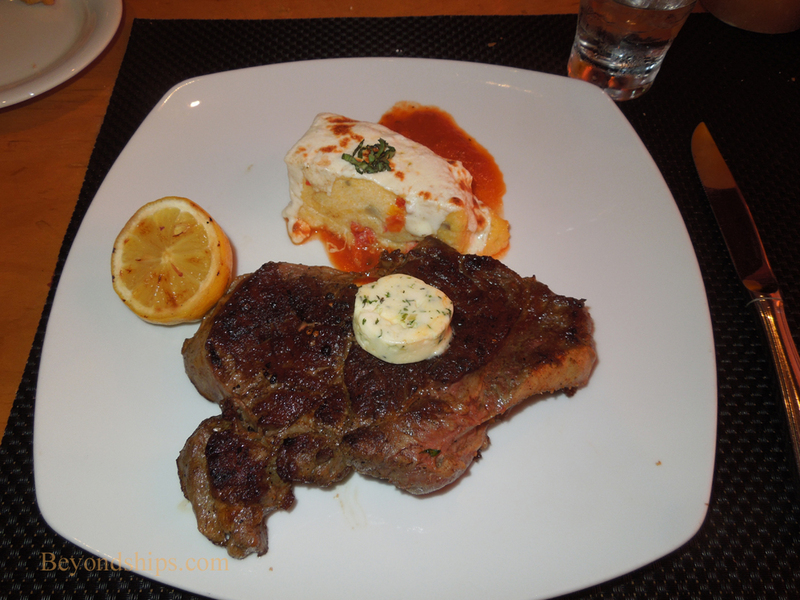 Cagney's is an American style steakhouse. Indeed, perhaps to underscore a link to Chicago, which is known for its steakhouses, there are portraits of Prohibition era gangsters amidst this venue's otherwise sober décor. The cover charge for dinner at Cagney's, with the new menu, is $30. In addition to dinner, Cagney's is open for breakfast and lunch for guests staying in the ship's villas and penthouses. For these meals, the menus are not steakhouse-oriented, although steak is an option both on the breakfast menu and the lunch menu. Rather, the offerings have a wider scope including such things as kosher roast chicken half and flounder as well as lighter fare such as sword fish burgers. There is no cover charge. 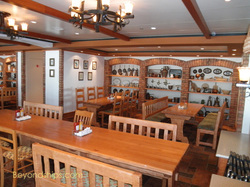 Aft on Deck 12 is Mama's Kitchen, the ship's Italian restaurant. The menu for this restaurant was upgraded in 2012. Here, the cover charge is $15. Jewel's most recent addition to its line-up of specialty restaurants is the Moderno Churrascaria. It overlooks the ship's lobby from the location where Jewel's Mexican restaurant used to be. Moderno's cover charge is $20.